Most DIY decorators tend to use a brush and roller for painting, so they’re generally fascinated when they see us using a paint sprayer! While not perfect for all jobs, a spray gun is often our ‘go-to’ tool for a fast but professional finish – so here are our top tips on how to get the best out of this great device for your interior decorating. We say this again and again because it’s so important, but one thing that separates the DIYer from the pro is the effort we make to prepare the surface and surrounding area properly before we begin painting. This is crucial when using a paint sprayer – unless you want a shoddy finish, and who does, right? Wear old clothes and always use a mask because it’s a potentially messy job. Cover everything that’s not being painted if you want it to remain that way – this includes radiators, switches and light fittings if you’re painting the ceiling. Use polythene sheets and masking tape to give you clean lines on adjacent walls – there’s no need to cut in if you take your time and mask correctly. This is, of course, unnecessary if you’re painting all of the walls and ceiling. Using a paint sprayer is a little different depending on the make/model, so it’s vital for you to read the instructions carefully so you know how thin the paint needs to be. Decent preparation of the paint will make spraying easy, but if you don’t stir it properly or ignore the directions regarding paint consistency, you’re going to have problems with the sprayer clogging up and jamming. It’s probably worth going to the trouble of sieving the paint to ensure it’s running as freely as possible because being diligent at this stage will save you a lot of time and frustration later on! Spraying is relatively simple, but you’ll need to practice first. You should be provided with some test sheets to make sure you get the consistency of the paint and the required smoothness of your action right before being let loose on your walls. If the paint splatters, it’s too thick, so add a little water and try again until the flow from the sprayer is clean. A consistent action with the sprayer is essential for even coverage, so try to keep your arm moving parallel about 20cm from the surface at all times – this is no place for sweeping arcs that front-load the paint! As with a roller, it’s important to overlap the edges for proper coverage too. For a better finish, it’s worth repeating the above process in the other direction too, to cross coat the surface. That’s basically it – once you’ve finished, clean the sprayer well and sit back and admire your handiwork! 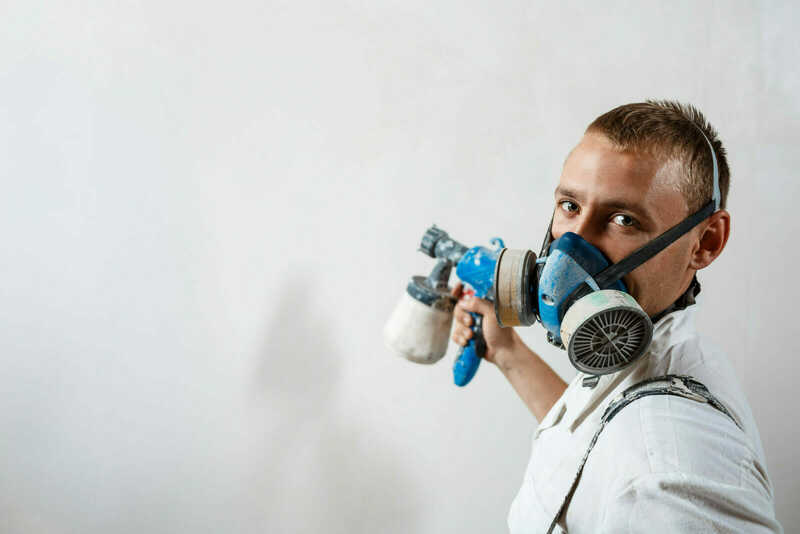 While it’s a tool we’d never be without, we appreciate that using a paint sprayer might feel a little daunting for someone with little DIY experience, so if you’re looking for some decorating help in Leeds or local areas, please contact us for some advice and a quote.